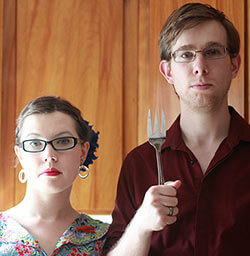 Frances and Doug became caretakers of a 1950s time capsule house two years ago. 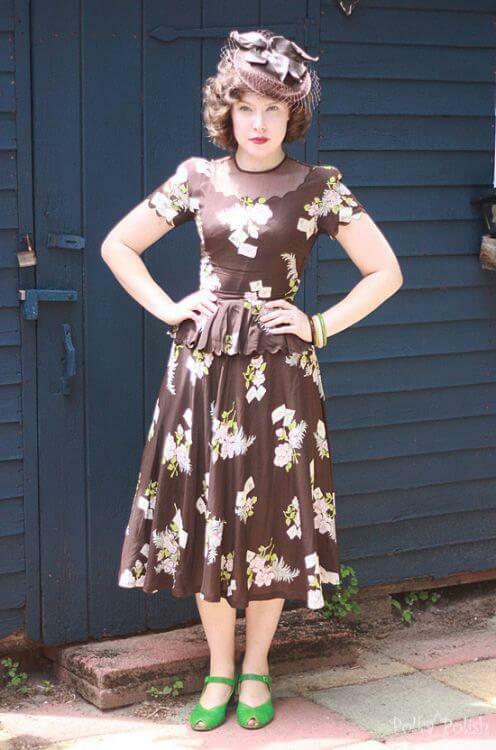 The couple already appreciated vintage style — Frances writes about vintage fashion on her blog Polka Polish — which is terrific! They loved the home, but the kitchen was feeling tired and in need of a refresh. 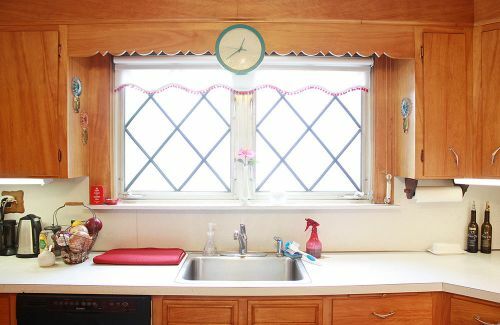 On a tight budget, they looked to thrifty vintage finds and solutions to restore the kitchen affordably. 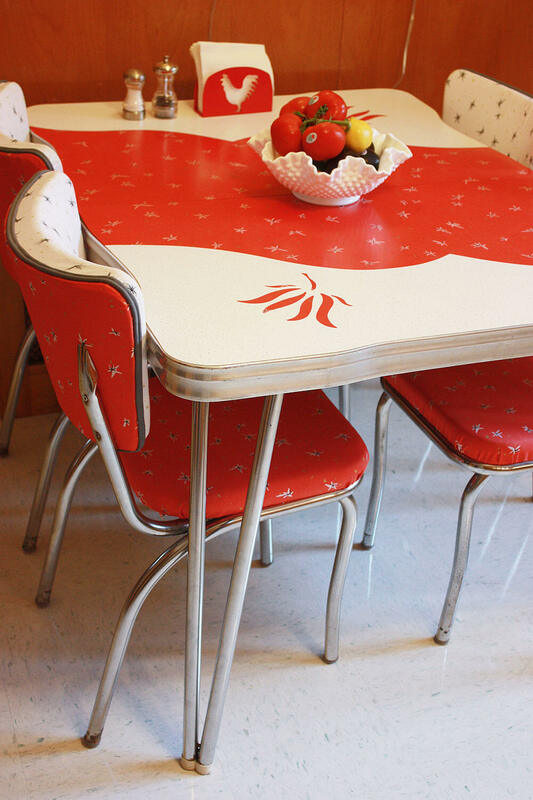 After a few key fixes — including a charming vintage dinette set, Armstrong VCT flooring, and pom poms (!) — their kitchen once again feels warm, inviting and ready for another 60 years of happy service. 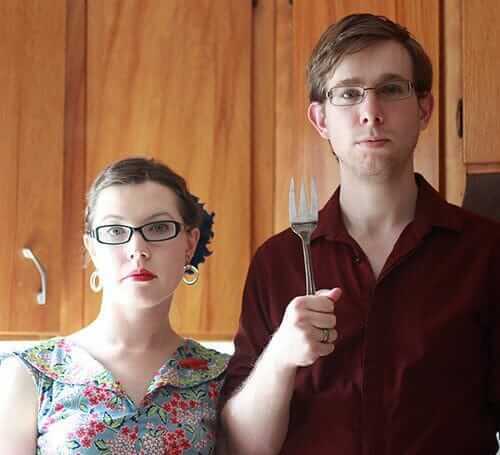 My fiance and moved into a time capsule 50s or 60s house two years ago. Hardwood floors under ancient carpet, yellow and black tile bathroom, wallpaper, pinch pleat curtains, about nine chandeliers, the works. We don’t own it, but we’re its babysitters in a way (it’s an investment by his family while he and his sister attend graduate school), so while we work on improving it we’re trying to be thrifty and to strike a balance between modern sensibilities and what the house wants. Naturally, Retro Renovation has been a huge help. 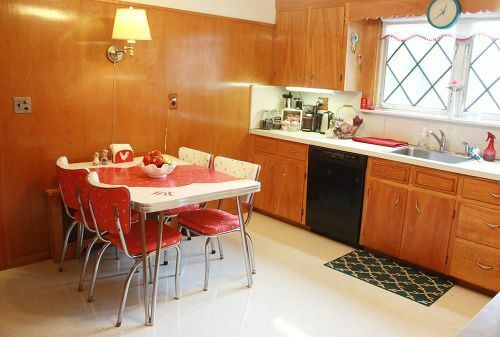 Once upon a time, our kitchen had salmon walls, a copper vent hood, copper drawer pulls, copper switch plates, copper contact paper with starbursts, and copper-sparkle linoleum. Unfortunately, time was not incredibly kind to our kitchen. 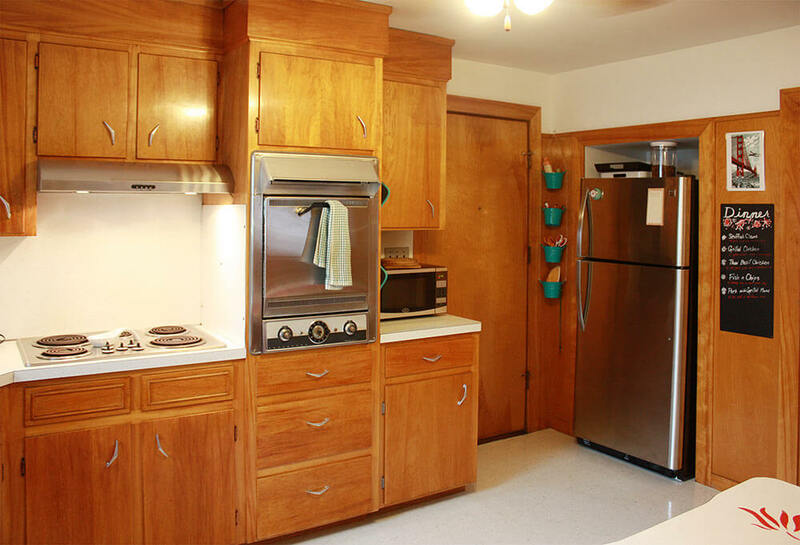 By the time we got to it, the vent hood was broken, the linoleum was a sad and worn-down brown and muddy green, and someone had painted the salmon walls white. 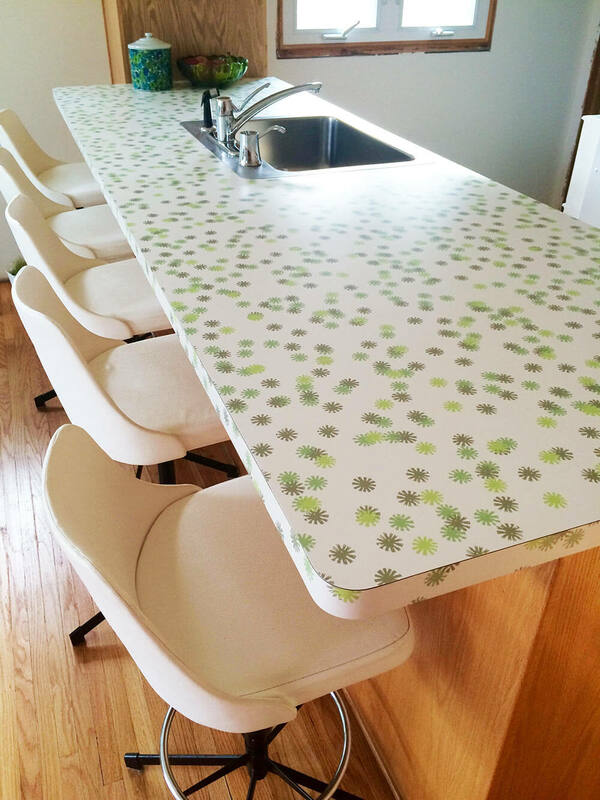 Unfortunately, the contact paper and floor had to go, but we did keep the sparkle laminate! We worked with what we had. 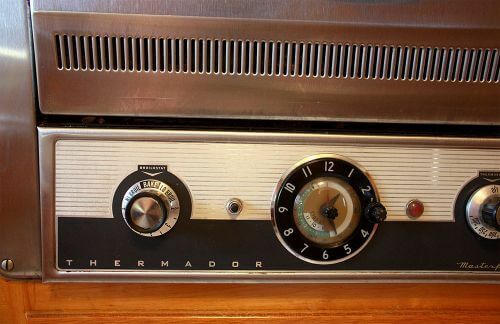 Our starting points were the wonderful Thermador Masterpiece oven, the fantastic Ajax drawer pulls, the gold-flecked linoleum countertops, and so much Amber Shellac. 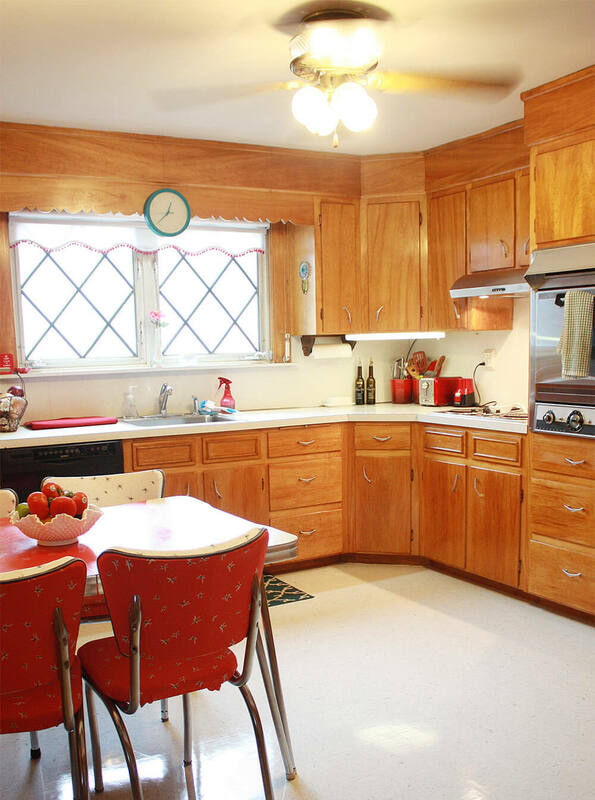 The goal was to keep the kitchen true to its origins and the style of the house while making it just modern enough to please the less-vintage-inclined. 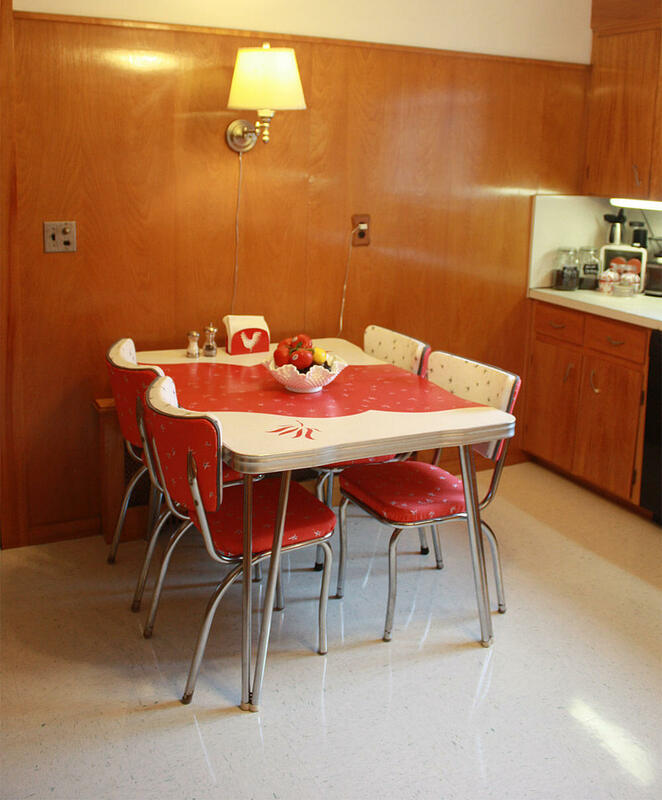 The kitchen is quite spacious, so I was determined to find the perfect dinette for it. I found mine via Craigslist, and (although I may be biased) I think it’s one of the niftier ones I’ve seen. The chairs were pretty badly torn up, so I reupholstered them with upholstery-weight cotton fabric from Spoonflower in my own copy of the original print. 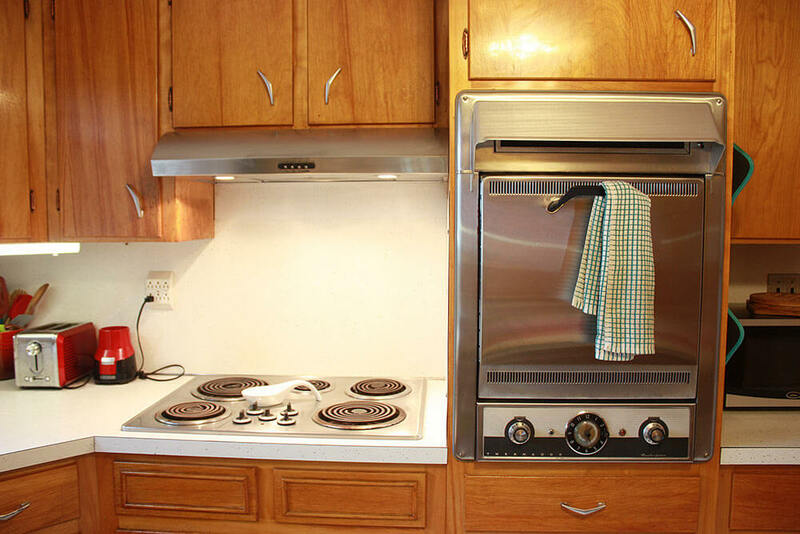 With the Thermador as our centerpiece, we decided to go stainless. When the fridge died we replaced it with a shiny stainless model. 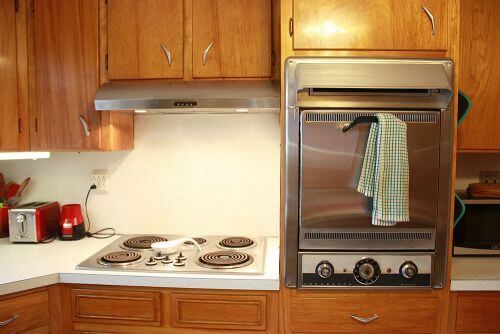 When we finally decided to remove the copper range hood, a Whirlpool model from Lowe’s completed the set. Now that we’ve scrubbed 60+ years of grime off the oven, it’s a perfect match! The vent fan is strong enough that not even a burning tortilla will set off the fire alarm, so that’s always a plus in my book. 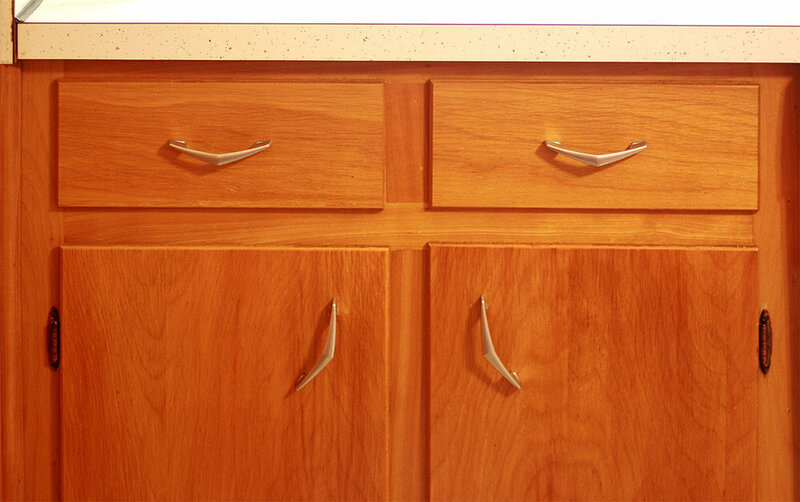 I wanted to spiff up the peeling and worn Ajax boomerang cabinet drawer pulls so I had to first remove all 27 (!!). I tried to polish the pulls, but the original copper plating was flaking and wearing off. 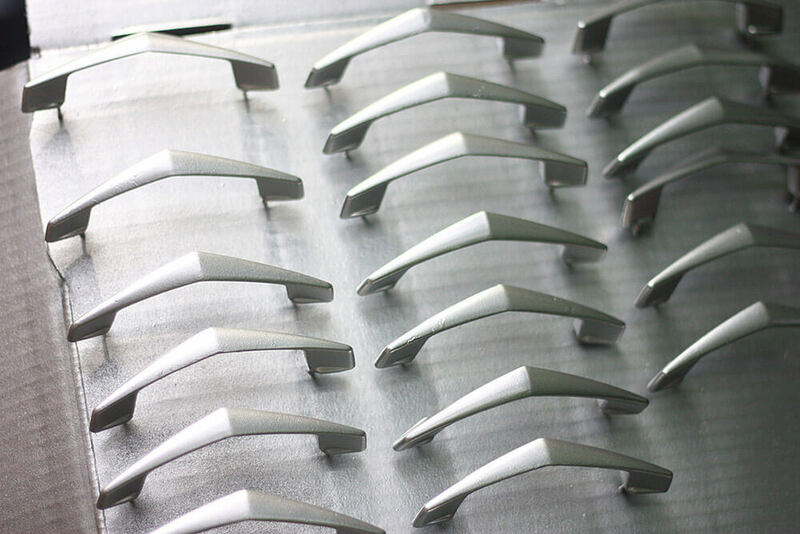 Since the centerpiece of our kitchen is easily the original built-in Thermador Masterpiece oven, it made sense to switch our metal choice slowly to stainless or chrome. Early on I had tried redoing the pulls in silver leaf, but it was wearing off so I looked up spray-on chrome options. You can get really dang expensive and fancy with the process, but I ended up just going with Rustoleum in the end. 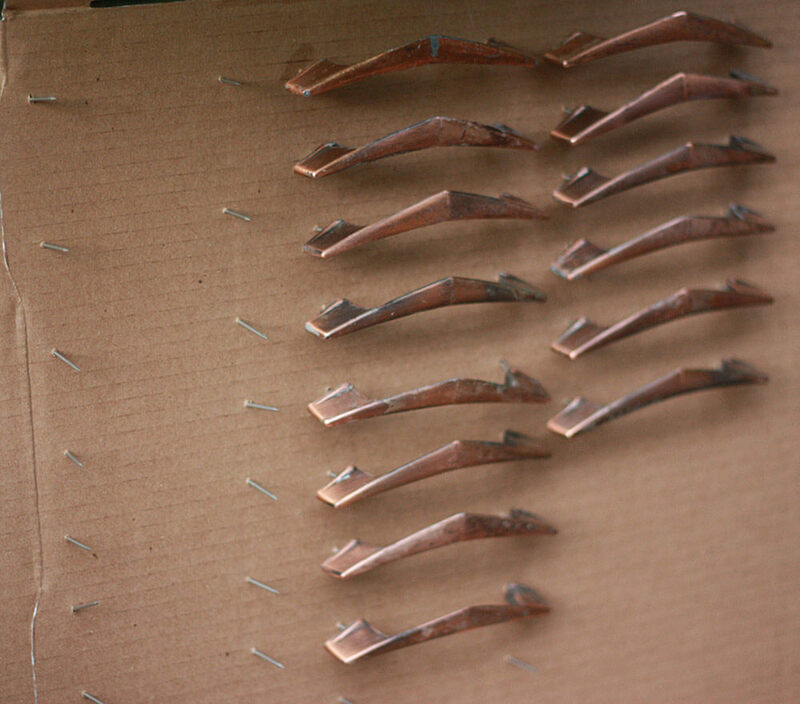 Each pull was scrubbed thoroughly, and I prepped a piece of cardboard with nails poked through as a little drying rack for my pulls. Each pull went on a pair of nails, and everything got a good coat of gloss black. Once that was dry, I spray painted metallic silver in light coats until they were shiny enough for my liking. 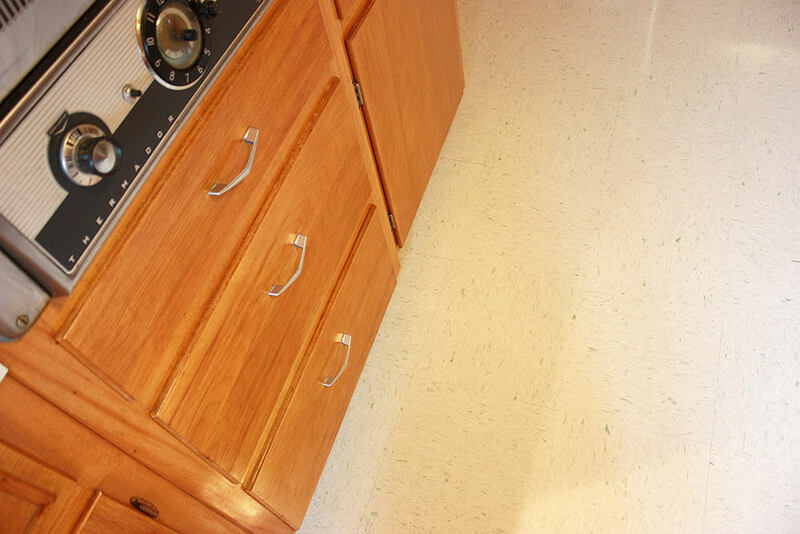 For extra kitchen durability, everything got a coat of clear gloss at the end. 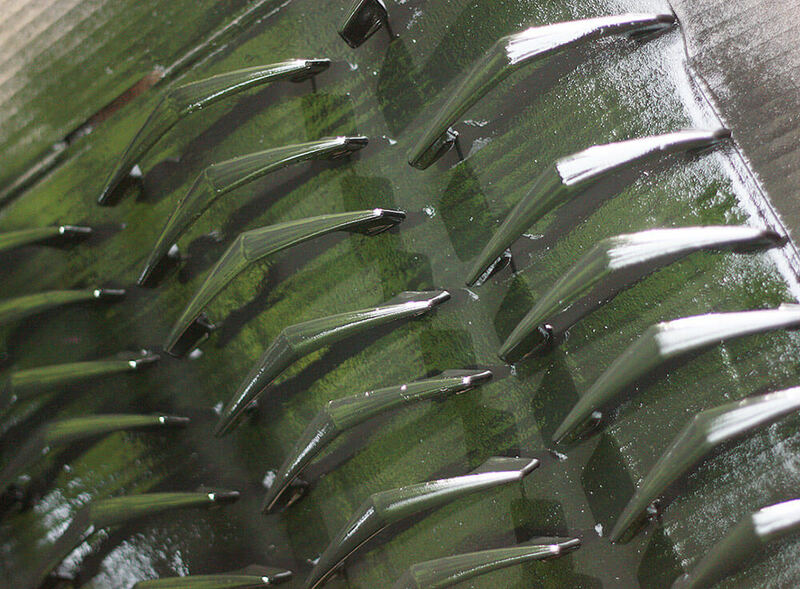 I let the pulls dry overnight before putting them back on, but if one could bear it, they could use to dry longer… a few of mine are dinged already from not being dry enough, and I’ll have to pull those off again and repaint them. All in all, I’m really happy with the project and they give the kitchen a bit of new life. Just don’t ask what I’m doing about the door hinges. Red and aqua seemed like natural accent-color choices. I had two pieces of color inspiration going into the project: An art print of the Golden Gate Bridge and the collection of three plastic flowers hanging by the sink. The red table solidified the choice, and I looked for other places to bring in those two colors as I went through. I replaced the original roller blind with a custom-cut Levolor one, with scallops to mimic the original. 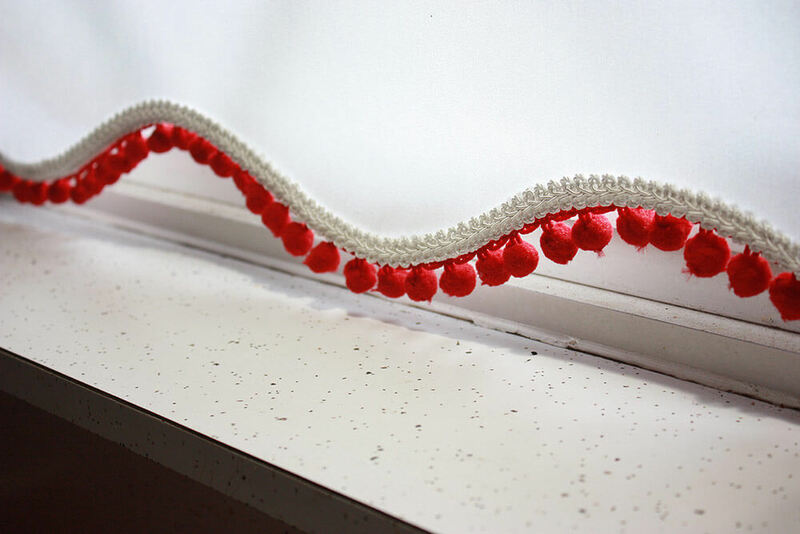 I added the red pom-pom trim myself after getting it home to inject a little more whimsy. The pom poms were just about the easiest part of the whole kitchen. Following the advice of many other Retro Renovators, we went with Armstrong VCT for the floor. We were told there was a good chance our linoleum was attached with asbestos glue, so [Precautionary Pam here: I edited this part because I want every Retro Renovator to consult with their own properly licensed professionals regarding how to handle. Read more about the various hazards in old houses: Be Safe / Renovate Safe.] We ended up settling on Emerald Haze, a white base with dark aqua and pale grey flecks. Installation was much more painless than I had feared, and the floor looks so wonderful and shiny! So, for now, our project is at an end. I just need some finishing touches—I would love some new floor mats, and I’m still holding out for a better light fixture to go above the table… maybe a cone light sort of sconce? P.S. We discovered a bit of a Woddity while we were tidying up… our ceiling fan seems to have a night light! 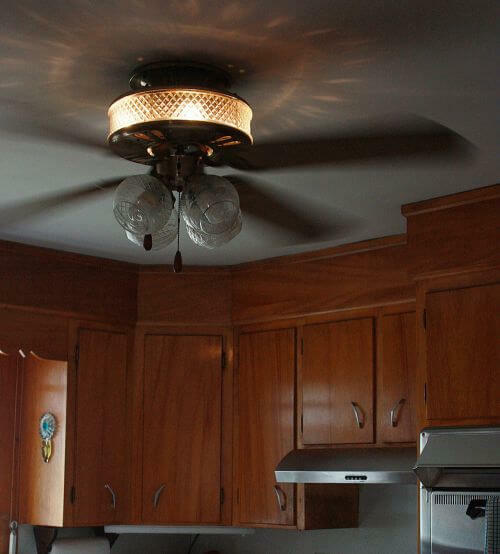 I’ve certainly never seen anything like this before, but I am not a ceiling fan expert. 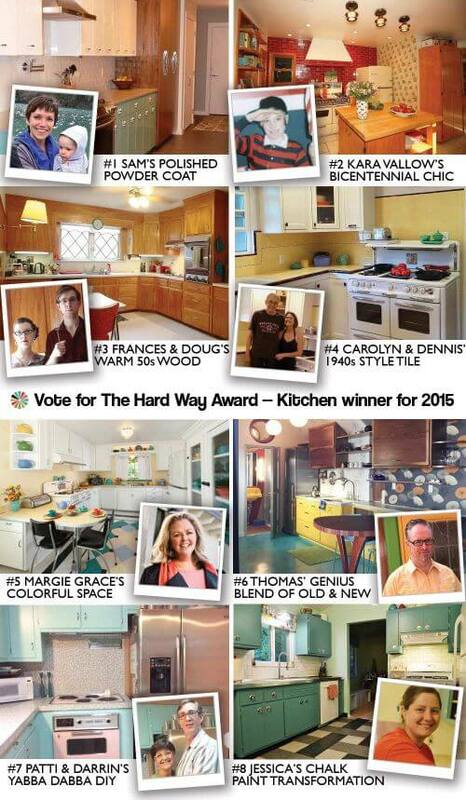 Frances and Doug — you did a fantastic job refreshing your vintage kitchen! The cabinets are so glowy, and the floor looks great and that dinette set is fabulous. 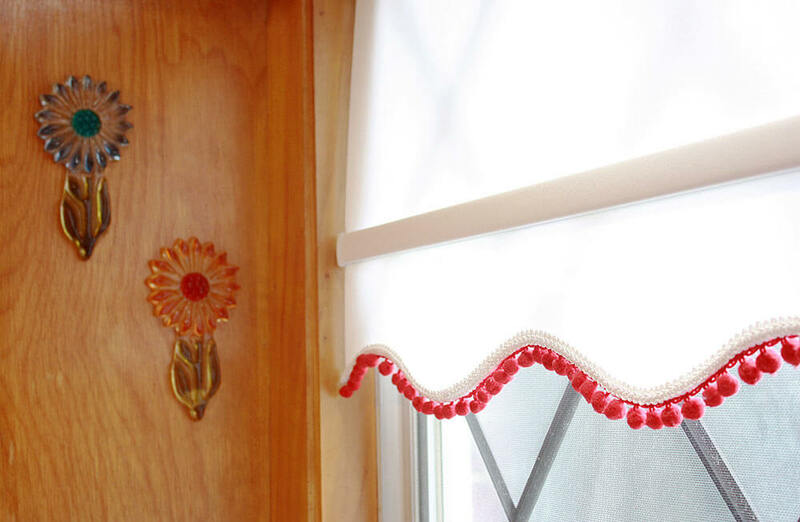 Both Pam and I agree, we are IN LOVE with the red pom poms on the scalloped roller blind — absolute happy genius! 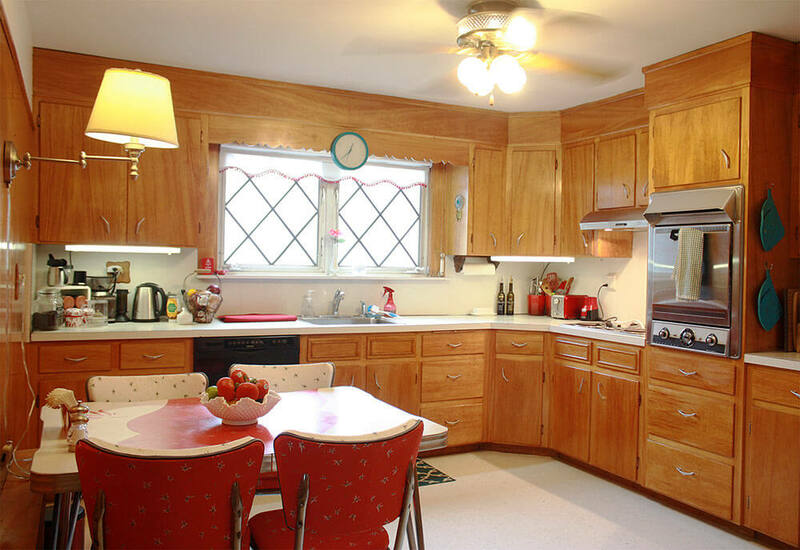 Pam also says she adores your medium-tone wood cabinets — this is such a classic material and color — such a classic, livable, and here she wants to say it — a timeless 20th Century kitchen. Perfect! I have done absolutely nothing with the Amber Shellac. Yet. The recent Shellac articles on the blog led me to do a few spot checks and confirmed my suspicions that every bit of wood in the house is coated in Amber Shellac. Floors, wall panels, cabinets, doors, trim… Everything. Pam also notes: As noted in yesterday’s story (read the details to see how I-XL finished wood vanities) — and consistent with reader comments on this recent story about Amber Shellac — it seems like a best practice to make sure the shellac does not get affected by moisture may be to top it off with a coat of varnish, which is more water resistant. Do more research — something to consider. Congratulations on a job well done and mega thanks for sharing your process and fabulous final results with all of us! Was a wonderful walk down memory lane for me. My folks kitchen was similar, although their wood was painted. 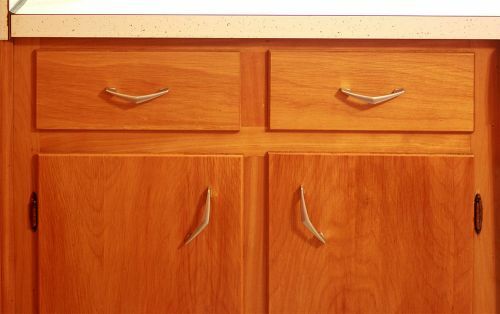 And they had the EXACT same drawer pulls/cupboard handles. In copper no less. Got switched out in the 80’s for something fru fru and don’t know what happened to the old ones, probably scrapped. 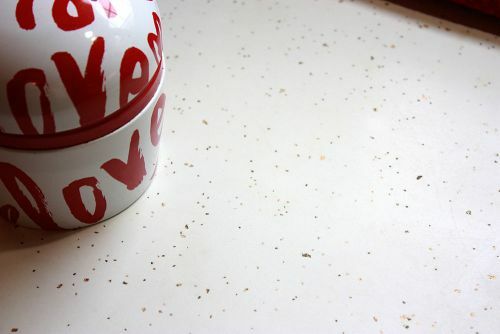 Please share how to get stains off of of a 50’s white glittery laminate countertops. Your renovation looks great! In regards to the hardware pulls in the story, it is my opinion to have them professionally re- plated. I have done this for fixtures and hardware in my house. It is long-lasting. I have very similar cabinets with a manufacturing date of May 3, 1957, stamped on the bottom of a drawer. I also have the same copper door pulls. The drawers have slanted fronts and no pulls whatsoever. 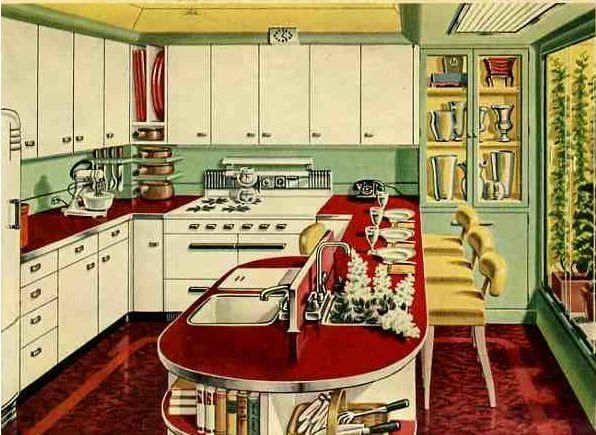 I would love to find more of the cabinets so that I can use a matching set in the kitchen I am planning to enlarge someday. Thanks so much for sharing your story. If other readers know of matching solid maple cabinets for sale, please post your information on this site. Beautiful! 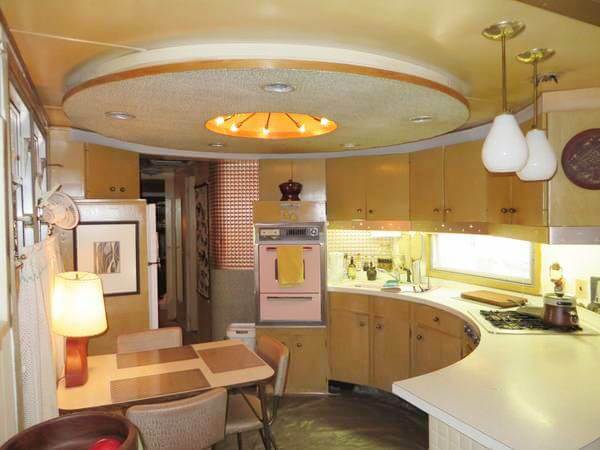 Where is this kitchen located? Hi Lauren, I don’t usually identify locations unless the reader featured includes that invite.